Mountaineering disasters are something of an obsession in the climbing community, often fanatically picked-over even years after the fact. Joe Simpson and Simon Yates' trek up the west face of Siula Grande is peculiar among them in that it was not a failed ascent per se. Both men ultimately return alive — though not at the same time. When Simpson breaks his leg on the descent during a storm, the two attempt a self-rescue until Yates unknowingly lowers Simpson over a cliff edge. In the midst of whiteout conditions, unable to pull him back up and close to being dragged down himself, Yates cuts the rope tying them together, causing Simpson to plunge into the abyss. Yates' decision is still debated, but David Grieg's production, based off Simpson's memoir, is not here to open old wounds. In filtering the story through the point of view of Simpson's sister and Simpson's own altered state of mind, the play is, in its best moments, a gruelling and gorgeously choreographed exploration into the limits of one man's endurance. Yet for a tale that traverses the extremes of human experience, Touching the Void seems determined to tread the middle ground. 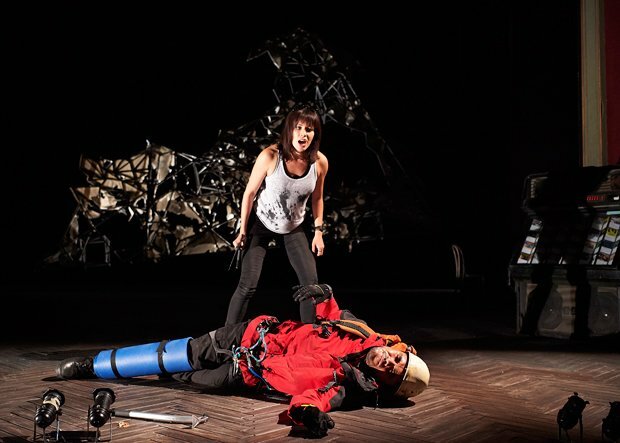 A thumping musical number about climbing and the jocular humour of their sidekick Richard feels jarring amidst the subject's inherent darkness. Edward Hayter's Yates is also curiously bloodless, even after he has supposedly killed his partner. The production is held aloft, however, by a truly mesmeric set design: the slopes of Siula Grande are evoked by a complex geometric web, and the darkness on stage is deftly, magically manipulated into vertiginous crevasses. Perhaps it is then appropriate that, in this tale of human ambition, frailty and fortitude, that the true stars are the implacable mountain and the endless void itself. The Royal Lyceum, until 16 Feb. Play based on mountaineer Joe Simpson's memoir, which charts his struggle for survival on the dangerous Siula Grande in the Andes. Adapted by David Greig.